Lots of top players with over 2200 rating have registered: 2009 and 2010 WOC Yusuke Takanashi (JPN), 2011 runner-up Piyanat Aunchulee (THA), Kazuki Okamoto (JPN), Seiya Kurita (JPN), 2008 WOC and 2010 runner-up Michele Borassi (ITA), Wachiraphan Huraphan (THA), Nicky van den Biggelaar (NLD), 2009 runner-up Matthias Berg (DEU), Dominik Nowak (POL), Takuji Kashiwabara (FRA), Chun Yip Tsoi (HKG), Roberto Sperandio (ITA), 1983 runner-up Imre Leader (GBR), 1993 and 1998 runner-up Emmanuel Caspard (FRA). Arthur Juigner is on team Switzerland. The young player from France played an excellent first WOC last year in Newark at the age of 9 (14th with 7.5 points). Bintsa Andriani is welcomed back after a 3-year ban and will continue to play for Madagascar. Twelve ladies have signed up: Akke-Lien de Boer (BEL), Marlis Elger (DEU), Caroline Nicolas (FRA), Marie Lightman (GBR), Linda Praseptyo (IDN), WOC (f) runner-up in 2005 Mami Yamanaka (JPN), 2010 WOC (f) Champion Jiska Helmes (NLD), Kasia Zieba (POL), Elena Averina (RUS), WOC (f) runner-up in 2009 and 2010 Veronica Stenberg (SWE), Duangkamol Sokunkate (THA) and 2011 WOC (f) Champion Jian Cai (USA). 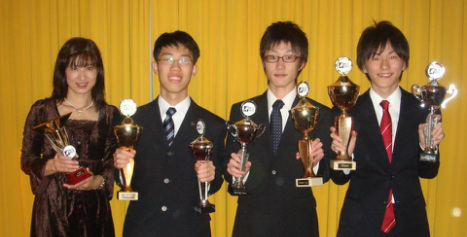 Mami Yamanaka won the Meijin (f), and Ouza-sen (f) this year, Jian Cai is the US National Champion. At the Thailand Sosuco open in July, Duangkamol Sokunkate became ladies champion, but also took the third place in the main category. Kasia Zieba won the Ladies Polish Championship and 2010 female champion Jiska Helmes was finalist at the female Meijin this year. I think the fight for the ladies trophy will be very exciting. If I have to name the top 4, I would say, Mami, Duangkamol, Jian and Jiska. The WOC 2012 poster shows that this year......, it's all about the ladies. The World Othello Championship head sponsor is Anjar Co. 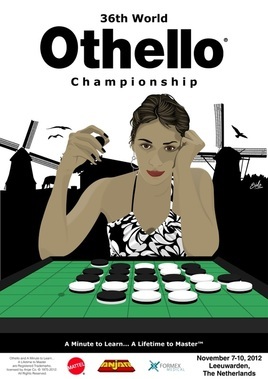 The 36th World Othello Championship will be held in Leeuwarden, the Netherlands, November 7 - 10, 2012. The venue will be the Eden Oranje Hotel, Leeuwarden. 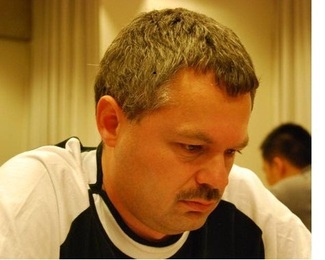 The tournament will be organised by the World Othello Federation and the Dutch Othello Federation. Japan, what a super team!!!!!! I want to make the WOF more visible. This can be done for example by improving the information provided through the WOF website. I also think the communication with the member nations should be better. We have very competent candidates for all the confederation positions in the new WOC council. It is important that the representatives for the confederations establish good relations with the countries in the region. There are a lot of countries that only have a contact person. I hope WOF can help them to establish national Othello federations, so we can see Othello grow all over the world.